It was Tuesday, November 7th, 2000 and instead of facing two or three days on the road, we were heading to Paris for three weeks, delighted with our decision to sell our apartment in Florida to allow us this freedom. Our previous visits to Paris had been just 2-4 days, just enough time to develop an appetite to explore some of the neighborhoods of this fascinating city. We arrived at Pearson Airport, Toronto, several hours prior to our evening departure from Terminal 1, which Air Canada recently began using for international flights. As we approached the departure area we were cheerfully greeted by a smiling hostess who checked our documents and directed us to the appropriate counter. The service was cordial and efficient and within minutes we were on our way to the Maple Leaf Lounge. Previously a restaurant, the large space has been redesigned, the glass wall overlooking the runways thankfully retained. Linda camped-out at a computer while I watched the U.S. election coverage on TV while enjoying the beverages and snacks. Time flew and we were soon boarding. The Executive First (love those frequent flyer miles!) cabin crew were experienced professionals with the sense of humor that always makes a long flight more bearable. The accommodating and pampering flight attendants kept up a stream of food and beverage service to meet everyone's individual needs. Most important, the size of the seat and the ample cabin space afforded maximum comfort and both of us curled-up after dinner and slept for several hours. We arrived at Charles De Gaulle airport early, thanks to a brisk tail wind, well-rested and ready to enjoy the day. It was a short walk to immigration and customs and we moved right through, once again feeling very pleased with ourselves for having mastered the wheeled-carry-on-for-each-of-us concept. On the way to the RER, we stopped at a bank machine to withdraw some francs. We always use bank machines, with our ATM cards, for the convenience and because we get the most beneficial exchange rates. The second class, round-trip fare was 49FF per person and the ride to the Chatelet Les Halles station in the city center took just 25 minutes. We decided to exit and walk to our hotel. We could have switched to metro line 1 in the direction of Chateau de Vincennes for just one stop to the Hotel de Ville station. That would have brought us closer to our destination but we were anxious to hit the streets. It was only a ten-minute walk and it gave us a chance to use our umbrellas as it began to rain as soon as we exited the station. In fact, the rain was with us a good part of the three weeks, but not enough to dampen our enjoyment. When we last visited Paris, we stayed in Le Marais and enjoyed it so much we chose the area again. After much research, we decided on Hotel Caron de Beaumarchais, located at 12, rue Vieille-du-Temple at the corner of rue Rivoli. Rue Vieille-du-Temple, north to south, is a cultural and fun experience. Every convenience is minutes away; fabulous bakeries and pastry shops, restaurants, bistros, cafes, wine bars, a self-service laundry, Internet stop, convenience stores and much more. Of great importance was the hotel itself since it would be our home for twenty days. We could not have made a better choice! Our hosts, Alain and his father, Etienne Bigeard, operate their 19-room gem in a low key, congenial manner. Our daily comings and goings were greeted with warm conversation and any questions or requests we had were responded to promptly and willingly. Their attitude and demeanor reflect the grace and charm of this 18th-century building, which was renovated in 1998. As we approached the hotel, we were struck by the charming, bright blue facade. The lobby, a comfortable lounge with reception area, is furnished and decorated in refined taste, recalling its namesake Caron de Beaumarchais, a former resident of a neighboring building and the author of the play on which the opera the Marriage of Figaro was based. A working marble fireplace is flanked by a lovely floral-print sofa and a chaise longue where I often enjoyed catching-up on my reading while logs crackled in the fireplace and classical music played in the background. In a front corner is an antique card table where four hands of cards are displayed as if frozen in time. Antique pieces, prints and old books add to the old world charm. Alain rose from his desk to greet us, remarked on our ability to travel so light, and escorted us to our room on the second floor. The nice size, air-conditioned, soundproof room was furnished with twin beds pushed together according to our wishes, a TV, a desk with a small vase of fresh flowers, two chairs, a bench and a closet for each of us. We loved the original beamed ceiling and the two sets of glass doors leading to the little balcony. The 18th-century motif continued in the floral print draperies, antique mirror and framed letters and prints that adorned the walls. The excellent size bathroom was up-to-date with quality tiling, tub and fixtures with a minibar in the cupboard under the sink. Umbrellas in hand, we strolled around the immediate area looking for a light lunch inspiration. At 30 rue du Bourg-Tibourg we located the famous establishment Mariage Freres. Founded in 1854, this is the tea capital of Paris. The windows of the graceful wood exterior reveal interior walls lined with canisters of teas from around the world. As we entered, the fragrant tea aromas filled our senses as clerks behind the counters patiently explained the attributes of the tea varieties to the customers. We passed the neat, old-fashioned cashier's cage as we headed for the small, pretty room in the rear and were fortunate enough to be seated immediately. (A return visit toward the end of our stay required a 25-minute wait.) There is also seating in an upstairs area, for smokers. Besides a menu of light delicacies, there is a small but wonderful selection of tarts and cakes. The tea menu is huge and intimidating for non-connoisseurs but that inconvenience is addressed by the proffered dictionary of teas, which spells out the characteristics of all the teas on the menu. It would, however, take days to study it and make a decision so since we both enjoy Jasmine, we took the easy way out and opted for the familiar. Linda had a cream and strawberry torte that she said was worth the air fare. My assorted sandwiches and salad were fine quality and delicious. The tea servings are substantial and we enjoyed the luxury of lingering, tea pots having been presented in warmers. There is a huge selection of paraphernalia for sale as well as a small tea museum. The right thing to do after afternoon tea is to take a nap after which we watched CNN to stay abreast of the U.S. election. Little did we know that it would still be undecided as we start to write this travelogue in early December. One of our goals this trip was to avoid the trendy and famous, expensive restaurants and to find good value, neighborhood eateries. Thanks to Jack, the Paris expert, whom we would be meeting in Brussels in a few days for the first time, and our dear niece, Jami, who lives part of the year in Paris, we had some wonderful recommendations to get us started. While we were out for tea, we spotted a cute restaurant, Alivi, which had been recommended by Frieda Lekkerkerker, an Internet friend. It was at 27, rue du Roi de Sicile, 75004, 01-48-87-90-20, right around the corner from our hotel. The cooking has a Corsican emphasis and was the beginning of our enjoying foods from around the world in addition to the wonderful French cuisine. We arrived at 19:30 and throughout the next hour the place gradually filled-up. We were glad we had made a reservation and would recommend that at most of the places about which we'll be writing. Surrounded by glass, it's pleasant to watch the action outside. Exposed stone walls and a beamed ceiling afford a comfortable ambiance. We both had a two-course 128FF menu. Linda went vegetarian, with an herb tart to begin and a baked eggplant and cheese casserole as a main. My choice was from the sea, starting with grilled filets of sardines on a bed of fennel and small filets of rascasse (a very ugly fish with beautiful flesh) sautéed with chopped eggplant, olive oil, balsamic and hot peppers. 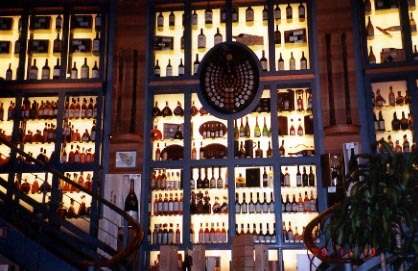 Together with the house red wine and the excellent service, we were off to a fine start in accomplishing our goal. After a good, long sleep on nice, firm mattresses and light pillows, we strolled over to rue des Rosiers for a bagel and Illy coffee at La Maison Korcarz - just enough to last until lunch as we headed east into the 11th arrondissement to see where our niece lives when she's in town, which unfortunately she wasn't at the moment. A walk along rue des Francs-Bourgeois is always a thrill; the narrow street is lined with historic "hotels", neat shops, enticing courtyards and of course Le Musee Carnavalet, devoted to the history of Paris and the French Revolution. We considered going in but the line was just too long. The street was alive with tourists enjoying the feel of Paris. Passing through Place des Vosges, we turned south on rue des Tournelles to rue de la Bastille and into Place de la Bastille to be greeted by the imposing Opera Bastille. Love it or hate it, it's big, very modern and in deep contrast to the surroundings. Much easier to like is the Colonne de Juillet, which honors the victims of the revolution of July, 1830. It's tall and graceful and crowned by the winged "God of Liberty" with a star on its forehead. We started north on the wide Boulevard Richard Lenoir and found ourselves in the middle of a fabulous street market located on the center island of the boulevard, stretching as far as the eye could see. Throngs of shoppers carefully selecting the perfect fish or sausage or cut of meat - mainly pork, lamb or veal as the beef scare is real - the array of cheeses and prepared foods was mouthwatering. As we dodged our way through the food, we came upon the clothing, shoes and household area, which also was packed with earnest shoppers. It was a sunny, cool day and everyone was enjoying it. Our destination was rue Oberkampf, between Ave. de la Republique and Boul. de Menilmontant. This quarter has become very popular with the budget-conscious who enjoy the Bohemian atmosphere and the ethnic diversity which enriches the neighborhood. By the way, budget does not mean cheap. We found it to mean terrific value - and fun too. Oberkampf is a delightful, narrow street full of life, energy - and food! There are shops selling cheeses and meats, a small supermarket, cafes, bistros, Greek fast food, pizza and pasta, Middle Eastern delights and tempting prepared specialties for take-away. We located Jami's building and would return another day after arranging an appointment with Jeff, who was renting during Jami's absence. In the meantime, we decided to try the first of Jami's recommendations for lunch, The Mecano Bar at 99, rue Oberkampf, 75001, 01-40-21-35-28, a traditional French bistro/cafe with lots of atmosphere. The eclectic mix of chairs, loveseats and tables in the front room, the larger dining room in the rear and the long, well-used bar combine to create an environment which is a cross between a used furniture shop and an old pair of shoes too comfortable to replace. We certainly loved the daily lunch special (55FF), lapin moutarde et tagliatelle. A roasted, nearly-whole baby rabbit lightly bathed in succulent mustard sauce and served on a large portion of perfectly-cooked noodles. The presentation was striking, so different from the cut-up versions to which we're accustomed, and the flavor was divine. The place was filled with young people from the neighborhood who appreciate the quality cooking at the low prices offered here. North of Oberkampf is rue Jean Pierre Timbaud, a street lined with superb-value restaurants, cafes, food shops, and services of North African and Arabic origin. In one of the many food stores we found the best Iranian pistachios at bargain prices and it didn't take us too many days to work our way through a kilo of the tasty, crunchy delights. The street was full of shoppers and shopkeepers in their native dress and, as at home in Toronto, we were intrigued by the daily life of other cultures that constitute a significant part of Paris life. The legendary Pere LaChaise cemetery occupies more than a hundred acres on Boul. de Menilmontant. Numerous well-known people are buried here including Chopin, Edith Piaf, Yves Montand, Colette, Haussmann, Sarah Bernhardt and Oscar Wilde, to name just a few. The tombs in the cemetery range from beautiful to ostentatious, evidencing the one-upmanship practiced here over the years. Rue de La Roquette runs southwest from the cemetery and leads to Place Leon Blum, the hub of the 11th district. As we approached the square, we were assailed by the wonderful aroma of chicken and lamb roasting and before long we came upon the source, an open front butcher and food store with chickens and lamb parts turning on spits. Across the way was a large open fish market with beautifully-presented offerings with customers lined-up waiting to make their purchases. The food festival went on as we continued our stroll and spotted a kosher butcher store on one side of the street and an Arabic butcher shop across the way - no political problems in evidence here. We were heading for another of our niece's favorite places, Cafe L'Industrie, at the corner of rue St. Sabin and rue Sedaine, for coffee and pastry. It's a cool, laid-back, typically French, linger, chat, read the paper and chill-out kind of place. The espresso hit the spot, though our chocolate cake and hot apple tarte tatin (upside-down apple cake) on English cream were good but not great. After a filling lunch followed by the pastries, a very light dinner was in order. We popped over to the colorful rue des Rosier to L'As du Fallafel. It was a mob scene but we lucked-out with a table for two before too long. Fallafel is not my thing but Linda loves those little fried rounds. The large pita pocket was overflowing with them and an assortment of vegetables (35FF). My lamb shwarma in pita was also a generous and delicious portion (45FF). If you're in the mood for Middle Eastern fast food, this is the place. We overslept the next morning and woke up in time for lunch and then wished we hadn't. This day was destined to be the only time we had poor meals. Chez Jo Goldenberg, 7 rue des Rosier, is supposed to be the best Jewish deli in Paris. We would hate to try the worst. The lunch isn't worth discussing. After leaving most of it uneaten, a stop at Finkelsztajn bakery was in order. I quickly devoured a poppy seed square while Linda took the opportunity to control her appetite. One of our favorite buildings is the Hotel de Ville de Paris (City Hall). It was covered with scaffolding last time we were here and the results of the clean-up and restoration are magnificent. It is the highlight of rue Rivoli at number 29 in the 4th arrondissement. 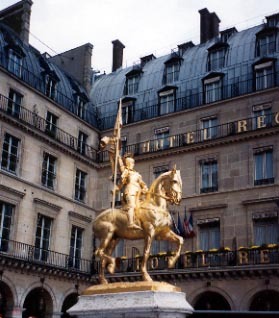 At the junction of rue Rivoli and rue St. Honore, 1st arr., is the huge Palais-Royal. Government offices occupy the interior but the gardens, enclosed by the rectangular palace are certainly worth a visit. Even in the chill of a gray day in November there is the allure of tranquility in the middle of the city; benches and chairs provide a welcoming and relaxing ambiance amidst the rows of evenly-shaped trees. The gardens are bordered by arcades and huge columns majestically stand guard. It is impossible not to stop and gasp in sheer pleasure as you walk north on rue de L'Opera and the Palais Garnier-Opera National de Paris comes into view. Now restored to its original beauty, to compete with the upstart Opera Bastile, it is again one of the most beautiful theatres in the world. Just north of the Place de L'Opera is the stately Boul. Haussmann where the flagship stores of Au Printemps and Galeries Lafayette, France's pre-eminent department stores, can be found. Parisians and tourists alike were out in droves kicking-off the holiday shopping season and the giants were ready with gorgeous Christmas displays and decorations. From the animated windows to the huge, beautifully decorated tree on high in the domed atrium of Galeries Lafayette, the holiday tone was set. Adding colorfully to the tumult were the sidewalk selling booths at the front of the stores offering budget-priced promotional items. Check out the splendid views from the roof of both stores and enjoy a meal in their sixth floor eateries. Southwest of the department stores in the 8th arr. is Place de la Madeleine where the Madeleine Church, looking like a Roman temple, sits surrounded by giant pillars. Climb the steps to the entrance of the church and turn around for a marvelous view down the rue Royal to Place de la Concorde and across the Seine to the dome of the Invalides. Two of the most prestigious food stores of Paris are also situated in Place de la Madeleine, Fauchon and Hediard. While appealing in the totality of their offerings, we thought smaller, individual specialty shops were more fun and better value. Hediard must be given high marks for a creative renovation, which offers a stimulating shopping experience. Our two trips to Portugal, which are documented in travelogues elsewhere on this web site, and the large Portuguese community in Toronto have given us the opportunity to discover all aspects of the Portuguese cuisine from grills to fine dining. 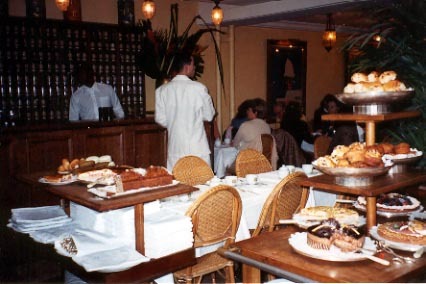 In our search for international dining here in Paris, we found several sites on the Internet recommending Restaurant Saudade, 34 rue des Bourdonnais, 75001, as the best for Portuguese. It failed in every respect; we called it a Portuguese nightmare!